by Hunter Allen - Let’s think about those leg muscles and all that they do, especially the quadriceps muscles (the big ones on top of your upper leg). The ‘quads’ tend to be the leg muscles that get the most work and also the most sore, and the quads contribute a significant amount of work toward propelling you forward on a bicycle as they are the muscles that help to push the pedal downward on each stroke. As you know, sometimes you have to contract your quads more forcefully when your cadence is slower and when you are going up a steep hill for example and other times you don’t have to push down very forcefully at all, but your cadence is very quick. The quadriceps, along with the rest of the lower body muscles, need to be able to contract forcefully and slowly and also contract lightly and quickly in order for you to become a successful cyclist. To me, it’s another one of the great things that makes cycling so challenging: You need to have the ability to pedal both hard and slow, along with easy and fast. The best cyclists can do a bit of each and while even the best cyclists have strength in one or the other, they also train these skills as well to improve the weaker of the two skills. You see, the rider that feels more comfortable mashing a bigger gear most likely has more ‘fast’ twitch muscle fibers (type II), whereas the rider that likes to ‘spin’ typically uses more slow twitch fibers (type I) and this is important because if you event is going to require you to pedal hard and slow, but in training you always pedal easy and quick, then you might not be ready for your event. This is where the ‘other’ quad comes into play. That other quad is called Quadrant Analysis. Quadrant Analysis is a tool that allows you to understand whether or not you are indeed pedaling correctly for your given event. What does ‘correct’ pedaling mean? Well, thinking back to this idea that “training to the specific demands of the sport is paramount to succeeding in that sport” and of course you would agree that practicing basketball all day is not going to help you win a 100 mile road race, and the same applies within the sport as well. Riding at a cadence of 100 rpm for 3 hours is not going to prepare you well for a race that is going demand that you ride at 80 rpm for 2 hours and then 100rpm for the last hour. You just simply are not training specifically for the demands of the event. This is where Quadrant Analysis comes into play. Scientific studies using a variety of techniques have found that threshold power (FTP) represents not only a threshold in terms of the power that an athlete can sustain, but also somewhat of a threshold in terms of fast-twitch fiber recruitment. To state it another way: When pedaling at a typical self-selected cadence, functional threshold power appears to occur at the power (and thus force) at which significant fast-twitch fiber recruitment first begins. Thus, not only does cardiovascular fitness play a role in your success, but so does your neuromuscular function. Neuromuscular function sounds complicated, but it simply means how fast you can contract a muscle, how strongly you can contract it, and how long you can keep it contracted before relaxing it again. Even though no commercial power meter has the ability to directly measure the forces applied to the pedals, it’s possible to derive the average (over 360 degrees) effective (tangential to the cranks) pedal force (both legs combined) or AEPF from the power and cadence data. (Refer to page 132- Training and Racing with a Power Meter for more info). One must also understand the relationship to velocity in order to really get a better understanding of this and circumferential pedal velocity (how fast the pedal moves around the circle it makes) or CPV can also be derived from cadence and crank length. What does this mean to you as a cyclist? Well, it means that with your power meter and Quadrant Analysis, you can make sure that you are indeed training properly for the cardiovascular AND neuromuscular demands of your event. Enough of this physiology speak; let’s examine some different Quadrant Analysis plots so you can understand how to apply this in your own training. The first plot is a plot showing you what a typical criterium would look like. Quadrant Analysis is incorporated into the newest version of the WKO+ software-Version 3.0 and is available online at http://www.trainingpeaks.com/. Figure 1 (below) shows how most of this race was spent in quadrant II (QII; high force, slow pedaling) and quadrant I (QI; high force, fast pedaling) and this is characteristic of a criterium in which the rider has to keep a high cadence to respond quickly to changes in speed, along with hard sprints which come relatively often either out of turns, for premes or for hard attacks. Figure 1. Quadrant analysis of a typical criterium. Quadrant Analysis is useful to first gain an understanding of just what the plots represent and then compare them to each other and to training. Let’s examine another race, this time the Tour De France stage win by Markus Burghardt in 2008 (Figure 2 below). Figure 2. Quadrant Analysis of Markus Burghardt's Tour de France stage win in 2008. 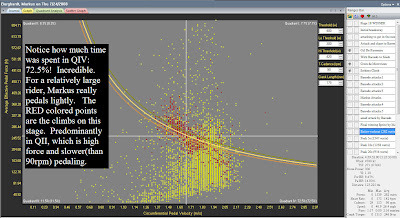 In this Quadrant Analysis plot, we see an incredible amount of time, over 72%, in quadrant IV (QIV), which is very surprising since Markus is quite a large rider and one would assume he has a higher percentage of type II muscle fibers and he might self-select his cadence at a lower cadence with higher force. However, one explanation might be that this demonstrates how incredibly fatigued his muscles are (stage 18 after all!) and that he had to pedal with a higher cadence in order to produce the same wattage. The more fatigued we are, the less strength we have in the type II muscle fibers and therefore we have to shift our recruitment to more type I muscle fibers in order to achieve the same FTP. Another explanation might be that he simply is very good at conserving muscular strength and has learned over the years of training and racing that if he keeps his cadence over 95rpm, then he’ll have more energy in the finale since type II (fast twitch) muscles require more glycogen and the more he conserves the better he’ll be towards the end. Lastly, the red colored points in this plot are the points from the three climbs on this stage and shift to QII, as he has to produce a higher force at a slower cadence in order to get over the climbs near his FTP. Points in QII require a tremendous amount of glycogen, so time spent in QII is very ‘expensive’ so to speak from an energy standpoint, but at the same time a necessary ‘expense’ if he Markus was to stay with his breakaway companion. Let’s examine one more power file from yet a different discipline and then we’ll take a look at how important it is to do Multi-File Quadrant Analyses as well. In this example, let’s take a look at a flat time trial. Figure 3. Quadrant Analysis of a flat time trial. A flat time trial produces another interesting and unique plot. In Figure 3 above, the yellow points that are following the ‘threshold curved lines’ demonstrate that instead of wildly fluctuating watts and cadence, his wattage stayed nearly constant (just below, at or just above FTP), while only his force and cadence changed. He focused his effort and maintained within a narrow range his wattage, so narrow that when you examine the percentage of time spent in QII and QIV, we find that he spent almost identical time in each. This does make sense as he was trying to maintain his FTP for the entire time and was limited by his cardiovascular system, but could still change the AEPF and CPV while maintaining his threshold power. This Quadrant Analysis plot also helps us to see that a time trial demands hardly any time in QI (maybe only the start and turn-around) and a flat time trial is characterized by an enormous amount of solid, steady hard effort, which is very obvious to anyone that has done a flat time trial, but on the other hand if you are only doing group rides and mass-start races, you might not be ready for the constant neuromuscular demand that a time trial takes. Now that you have a good understanding about the different quadrants, the different shapes of plots, let’s compare two different workouts together. The purpose of this is very similar to how you might want to use this yourself. Let’s compare a training ride to a race and see if the neuromuscular demands are similar. If they are, then great! That means the athlete is training in the correct quadrant and should be well suited for the racing demands. If not, then the athlete needs to figure out a way to train in the same quadrant(s) as the races in order to better handle the neuromuscular demands of racing. In this example, let’s compare a group ride in which the athlete did, including a series of hills in preparation for an upcoming hilly road race against the actual race which had a steep hill in it. Figure 4. Multi-file Quadrant Analysis of a hilly training session vs. a hilly race. In Figure 4 above, we see the race in red and the training ride in yellow and right away we can see that they do not match each other. 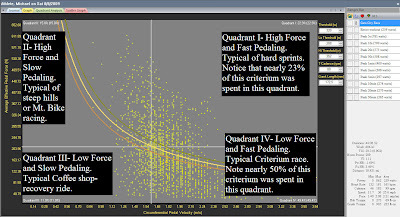 The training ride had a lot more time in QII and Quadrant III (QIII) then the race did. 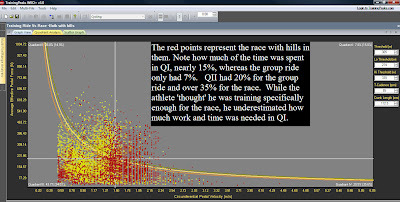 The yellow points in QII represent the hard hills in the group ride and it appears that the hills in the group ride demand a lot higher forces than the hills in the race, which are represented by the red points in QI. So, this means that the hills in the race were more like sprints (high force and fast cadence), whereas the hills in the group ride were more like…well…hard steep hills (high force and slower cadence). Note another significant difference as well, which is that the amount of time in QIV for the race (35%) versus for the group ride (20%), and this 15% difference is certainly significant as pedaling fast and not too hard is a critical skill to have in mass start races as you have to be able to match speed changes in order to stay on the wheels in front of you. In this example, the group training ride did not match up well with the actual race the athlete was training for, so my recommendation would be to skip his group training ride and do a ride more closely aligned with the upcoming race. In our last example, let’s compare a criterium to a micro-burst workout. A micro-burst workout is one in which you ride at 150% of FTP for 15 seconds “ON” and then at 50% of FTP for 15 seconds “OFF” and you continue to repeat this for a period of ten minutes, often 3-6 sets of them. The micro-burst workout is a great one to do in preparation for a criterium or any type of ‘bursty’ cycling event, including cyclo-cross. The workout can be done on either an indoor trainer or outdoors on the road. 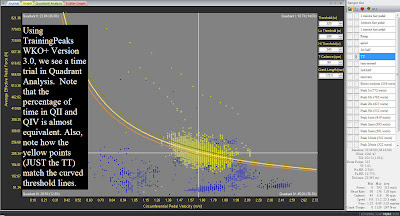 When we create a multi-file Quadrant Analysis using the WKO+ version 3.0 software, we see right away that the micro-burst workout (yellow points) has a significant portion of time in QI and so does the criterium (red points). Figure 5. Multi-file Quadrant Analysis of a micro-burst workout vs. a criterium. This is where the two workouts are similar and the “ON” portion of the micro-burst workout matches up well with the criterium, so that would be a nice example of training specifically for the demands of the event. However, most of the criterium is actually in the QIV, which is low force, and fast pedaling and most of the points in QIV would be criteriums, but the rest period (OFF) in the micro-burst workout is in QIII, which is low force but slow pedaling. So, the athlete in the off period needed to maintain a higher cadence in the “OFF” period than he actually did in order to even better simulate the criterium. I would suggest that both the “ON” and “OFF” periods, the cadence should be in the 90rpm or higher range. Besides this, I would say that this workout was a good example of trying to match up the demands of a criterium with a workout based on power. In conclusion, it’s not just your cardiovascular output (FTP) that determines your success as a cyclist. It’s also your neuromuscular output or how you create the watts that also determine your ability to succeed. Each of us has strengths and weaknesses related to how we prefer to create the watts. Some like to pedal at a faster cadence and some of us prefer to use a slower cadence but push harder on the pedals and while neither is necessarily better or worse than the other, certain races and terrain demand more of one than another. The key for you to understand is that when you train, you must train specifically for that event which has the unique demands so that you will be ready for those demands. If you need to be able to go up a 15% hill and do it in your 23 tooth cog, then you had better make sure you train in QII enough to be ready for that much muscular strength. If you are going to do a time trial, then it’s important that you are ready for a sustained hard effort in QII and QIV, without any ‘recovery breaks’ in QIII. These are just some of the examples of how important understanding the neuromuscular demands are in racing and training and as you go into your 2010 season, it makes good sense to get a clear picture of the exact demands you’ll need to meet in order to win!